Scribner Book Company, 9780743246743, 300pp. From the New York Times bestselling author of The Zookeeper's Wife, an ambitious and enlightening work that combines an artist's eye with a scientist's erudition to illuminate, as never before, the magic and mysteries of the human mind. Long treasured by literary readers for her uncommon ability to bridge the gap between art and science, celebrated scholar-artist Diane Ackerman returns with the book she was born to write. 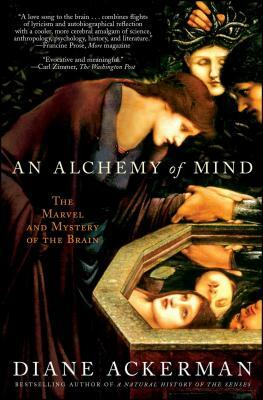 Her dazzling new work, An Alchemy of Mind, offers an unprecedented exploration and celebration of the mental fantasia in which we spend our days--and does for the human mind what the bestselling A Natural History of the Senses did for the physical senses. Bringing a valuable female perspective to the topic, Diane Ackerman discusses the science of the brain as only she can: with gorgeous, immediate language and imagery that paint an unusually lucid and vibrant picture for the reader. And in addition to explaining memory, thought, emotion, dreams, and language acquisition, she reports on the latest discoveries in neuroscience and addresses controversial subjects like the effects of trauma and male versus female brains. In prose that is not simply accessible but also beautiful and electric, Ackerman distills the hard, objective truths of science in order to yield vivid, heavily anecdotal explanations about a range of existential questions regarding consciousness, human thought, memory, and the nature of identity. "Ackerman [is] our poetic chronicler of the natural world." "[A] lovely...arresting...discourse on brain science." "Partly close observation, partly free association, Ackerman's paean turns the inside of our heads into...[something] gorgeous, tender, jewelled." "A love song to the brain...combines flights of lyricism and autobiographical reflection with a cooler, more cerebral amalgam of science, anthropology, psychology, history, and literature."